Women consider different things than men when we shop for clothes, shoes, pets, cars, houses…and guns. We’re just built different. So, what should a woman consider when gun shopping for the first time? Women consider different things than men when we shop for clothes, shoes, pets, cars, houses…and guns. We’re just built differently. So, what should a woman consider when gun shopping for the first time? Why are you buying it? Is this a pistol that you’re going to carry with you for personal defense, a hunting rifle, something for home defense? Of course, you can have more than one, but unless you just happen to like guns and buy them because they’re neat (I may or may not fall into that category), you’ll want to have a pretty good idea of what you want before you head to your local gun dealership. Even if you don’t know a single thing about firearms, you’ll be a lot closer to finding something that’s right for you if you just know why you want it. A reputable dealership will be able to help guide you from there. How big is it? By this, I mean the literal size of the firearm. In the picture below, you’ll see two of my pistols. The one on the left is a .380 caliber, and the one on the right is a 9mm. Even though the gun on the right is more powerful, for every day carry, I generally choose the one on the left. I’ve gotten plenty of criticism from men for that choice, but men don’t have hips like mine. The bigger gun just isn’t practical for me to carry: it pokes me in the ribs and gets caught on my…uhm…curves…when I draw it from my holster. So if you’ve decided that you are going to concealed carry you have to take this into consideration. That makes it less safe, and it also means I can’t get to it in a hurry if I need to. I’d rather be able to effectively use the less powerful gun than carry a gun that does a lot of damage if I can get to it in time. Here are some other options for concealed carry firearms. How does it feel in your hand? This means that you should actually pick up a gun and see how it feels before you make a decision! A lot of men have a hard time shooting my little .380, but they do fine with that 9mm. The smaller gun just gets lost in their huge grip. However, it’s generally much easier and more comfortable for other women to shoot the smaller gun because it’s easier for them to grip appropriately. Even though the recoil on the two guns is about the same, women tend to be more accurate with the gun that they can correctly grip. Pick them up, try them out, and see for yourself before you make a purchase. Can you shoot it accurately? I understand that most dealerships aren’t going to let you take the merchandise out back and shoot it, although I have seen a couple that do. Here’s my recommendation: go to a range that rents firearms, get somebody to give you a little bit of instruction, and try a few different things. 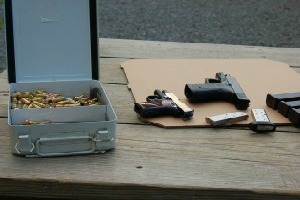 Shoot revolvers and semi-automatic pistols, test a variety of calibers, and see what you like and don’t like. If you’re accurate with a small caliber revolver and feel more comfortable with it than anything else, you’ve got a starting point. Don’t ever let somebody talk you into getting a more powerful gun than you feel uncomfortable with! It’s always more effective to hit something with a small caliber than it is to miss with a larger one. Are you going to shoot it regularly? If it scares you to shoot it, don’t buy it. Responsible gun owners should practice regularly, at least a few times each year, with any gun that they rely on for defense. Choose something that you like and that you want to take to the range, and then follow through.